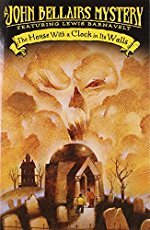 A boy goes to live with his magician uncle in a mysterious mansion that has an ominous ticking sound coming from its walls. The House With a Clock in Its Walls is a gothic horror novel for younger readers by John Bellairs with illustrations by Edward Gorey. Published in 1973, the work introduced the character of Lewis Barnevelt, his magician uncle Jonathan and his witchy neighbor Florence Zimmermann, who live in the town of New Zebedee, Michigan. Johnathan and Lewis live in the eponymous House, which was previously the property of a married couple of evil magicians with some very nasty secrets. AV Club: Is there still room for scares in The House With A Clock In Its Walls? "Structurally, Lewis is a Gothic heroine. Orphaned by a midnight accident and cut off from his old life, he travels to a remote town where he lives with his mysterious guardian in a splendid mansion with a supernatural curse. Lewis is a bookworm; he does the requisite skulking, eavesdropping, exploring abandoned rooms, and discovering horrible secrets. He doesn’t faint, although he comes pretty close when a scary moth gets in his hair. He seeks the affections of a cold, insulting, hyper-masculine figure of romance—Tarby, the class troublemaker, who is at a Rochesterian low ebb with a broken arm. His misplaced affections lead him into disastrous attempts to prove his love. And through resourcefulness, courage, and openness to cosmic forces, Lewis triumphs over the curse which pervades his home and torments his uncle." As a kid growing up in Michigan I found the familiar elements of the settings to be part of the books' charm but I also liked the way the kids interacted with the grown-ups in their lives -- Uncle Jonathan and Mrs. Zimmerman always seemed like the sort of people you'd want to have in your life, even if the cost of doing so was a bit of terrifying supernatural peril. And the Gorey illustrations enhanced the books immeasurably. Bellairs was also the author of "The Face in the Frost", a fantasy novel with a cult following. Those who liked his juveniles when they were younger might find it worth seeking out. I have been trying to remember the name of this book for the last couple of months. Thank you for the post! For some of a certain age, the Bellairs books were the highlights of Scholastic Book Sale Day. For others the gems discovered in solo expeditions through J FIC 813.54 after getting a library card of their very own. For a few, they were special presents from a gothy aunt who could tell you were lonely and strange too. Or now it's maybe just a recommendation for what to to get for your birthday after you'd just burned through Harry Potter, in a 'customers also liked' algorithm (which is the saddest way, but still a gift). If you're going to read or re-read them, I recommend waiting for autumn, and reading them in a treehouse or hay loft or bike shed or some other child's hidey-hole, until you're shivering and blue-lipped from cold and it's a bit past too dark out to read by, and time to come in for supper of tomato soup and grilled cheese sandwiches cut into proper triangles. Or at least inside a blanket fort, by flashlight, with a waxed paper sleeve of Ritz crackers and a bottle of ginger ale. Did this get posted because the trailer for the new film adaptation came out today? I'm not sure if Uncle Jonathan is quite Weird Beard enough, but I immediately recognized Mrs. Zimmerman's umbrella. And it's certainly got to beat the 70's tv adaptation. Lord, I adored the first two books in this series, when I was a kid. So atmospheric and creepy, with such lovable characters. I'd never thought of Lewis as a gothic heroine, but now that you mention it it does kind of fit. Lewis is just such a sweet little loser of a kid, making all the wrong choices in his desperation for friendship. The Letter, the Witch, and the Ring was the first book I encountered where an author plainly got tired of their protagonist and relegated them to a cameo, which offended the hell out of me at the time. I'd really liked Rose Rita in Figure in the Shadows but something about her seemed off in The Letter, the whole book just felt weird. I still kind of hate it when an author swaps out heroes on you like that. I feel like I'm watching them strain to keep themselves interested, and that's no fun at all. I re-read those first two books in my twenties and they were still fun even if they didn't quite hold up to my childhood love, and I'd hesitate to re-read them now because as I get older and grumpier I kind of find that nothing holds up. I'm sorely tempted, though! The movie trailer disappointed me a bit, but apparently the film was written by Eric "Supernatural" Kripke so I'm holding out hope. It looks really Harry Potter-y, and the books aren't that. Black and Blanchett both struck me as too... unrumpled? Maybe technically they're the right ages, but Black always has this itchy, adolescent energy and Blanchett is far too glam. These characters should be a lot less edgy and cool, they're kind of homey, milk-and-cookies sorcerers. I wonder who the pretty young brunette is around the halfway mark. (Right after the "Timeless" title card.) I can't think of anybody in the novel she could be. Some manifestation of Selena Izard? I love John Bellairs!!! This was one of the first books I ever read that had the magical combination of scares and fantastic humor, and I was hooked on Jonathan and Mrs. Zimmerman’s bickering, the Fuse-Box Dwarf, and Lewis’s stubborn bravery in the face of evil. His Johnny Dixon and Anthony Monday books are similarly great. I’m going to have to reread this now. Lewis is just such a sweet little loser of a kid, making all the wrong choices in his desperation for friendship. The Letter, the Witch, and the Ring was the first book I encountered where an author plainly got tired of their protagonist and relegated them to a cameo, which offended the hell out of me at the time. I'd really liked Rose Rita in Figure in the Shadows but something about her seemed off in The Letter, the whole book just felt weird. I still kind of hate it when an author swaps out heroes on you like that. Interesting. The Letter, the Witch, and the Ring was the first Bellairs book I read -- I think it was a birthday gift from my older sister and suspect it was brand new when I read it. Possibly my preference for Rose Rita is due to the order in which I read them.. In any case, though, having just watched the trailer that bartleby linked, I have some reservations. It doesn't look like a train-wreck of an adaptation (if you want that, for some reason, can I nominate the horrible muddled mess they made of Susan Cooper's The Dark is Rising?) but I also agree that Jack Black and Cate Blanchett look like the wrong casting to me. On the other hand Kyle McLachlan might be interesting as Isaac Izard.. I have re-read as many Bellairs novels that I can get my hands on. I do think they hold up, or at least I love them as much as I did as a kid. Some haven't had the Gorey illustrations and I really missed then. I agree with Ursula on the casting. Oh, I love this book so much. It manages a marvelous combination of seriously spine-chilling scary, affectingly serious (without being sentimental), and gloriously funny (all of these united in the ceremony Lewis, Jonathan, and Mrs. Zimmermann perform to find out where the ghost is). Bellairs at his best is really as good as it gets. I'm especially fond of Uncle Jonathan; he's good at what he does within the limits of what he can do, without being a star like Mrs. Zimmermann, he's got a sense of humor (including about his own abilities), and as a middle-aged bachelor, he takes on the raising of a kid he's almost never met and does his best. I loved (and still love) this book, and to me, the trailer for the movie has absolutely the wrong tone. The book is way more Guillermo del Toro and way less Chris Columbus and the casting is inexplicable. The Kripke connection does *not* fill me with confidence, and I second the WTF Eli Roth sentiment above. Childhood retroactively cancelled! I really appreciate how Orson Welles-y Jack Black is getting. I was a huge Bellairs fan, and I will be forever grateful to Ms Andrews, my middle school librarian, for selecting me to meet and "interview" Mr. Bellairs when he came to my school to speak. He was as kindly and as generous as you might expect. I'm a sucker for Jack Black's style of humor, and I love Cate Blanchett, so I am looking forward to the movie, though I agree that the tone is a bit too slick and arch. Unfortunately, that's the trend in kids' fantasy these days. I devoured absolutely every single book by Bellairs as a kid, and House was my first. I’d developed a fondness for the fantastical and gothic and my mother - a children’s librarian, which, what a fantastic professional to have at your tiny fingertips - got this book in my hands. One nightly read before bed, I tipped over into the final act and couldn’t rest until I’d finished. Coming upstairs for bed herself, my mother barged into my room, demanding to know why my light was still on. In a rush of words, I explained the action and pleaded my case for staying up. My mom just beamed and said “the end is really scary, right?” She patted my doorway and told me to turn out the light when I was done. My mom died stupidly young, and she’s been gone 16 years already. It’s one of my best memories of her. I donated almost all my kids’ books a few years ago, but I might have a Bellairs kicking around somewhere. The tone of the trailer seems off in a way I can’t quite put my finger on, but it might be my childhood protectiveness kicking in. I loved this book. When I read it to my son a few years back, I was surprised at how much had stuck with me. The thing that put me off The Letter, the Witch, and the Ring and all of Bellairs' later books that I read, is that they literally didn't quite feel like the work of the same person. House and Figure both have this weird groundedness, so the supernatural stuff feels like this eerie intrusion. New Zebedee feels like a real place, and the people in it are so relatable. Lewis and Rose Rita felt like real, complicated kids and Uncle Johnathan and Mrs. Zimmerman both seemed like these lovable, eccentric adults who were totally there for the kids but were vulnerable themselves. On top of all that you've got these really daffy comedic elements, like the fusebox dwarf and the Ace of Nitwits. From Letter onward everything I read seemed kind of perfunctory and less lived-in. The kids became "plucky" and the threats became more generic. I'm not 100% sure if that wasn't just me getting older. Maybe Bellairs was as good as ever, but I just wasn't the same person anymore. But those first two books feel really special to me, in a way that his later books just didn't. But I'm not trying to knock the guy, because those first two books have meant so much to me and as I said it may be that I just grew into a person who couldn't enjoy his work the same way. All I know for sure is that at a certain time of my life these books were so great. Loved this when I was a kid. I've never met anyone who had even HEARD of these books, much less loved them as I did!